Welcome to First Congregational Church's Nursery Ministry. We love children, and our goal is to give them a positive and loving impression of Christ and the church. 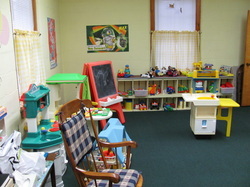 We welcome infants and toddlers and their parents to the Nursery every Sunday morning. The Nursery provides a safe and warm environment for our youngest children, so that parents are free to attend services and adult education programs in the Church. We strive to provide a healthy and safe environment for the children. Our nursery is equipped with cribs, changing tables and toys. Each Sunday morning the nursery is staffed with nursery teachers to care for the young ones. Nursery care is available at 10:00 am until the time of worship ends. Safety is of the utmost importance. We want your children cared for in a worry free environment so you can enjoy your time of worship and opportunities for spiritual growth in your life.